If you’re looking to replace your current go-to headphones and want something that will last, these are a great option for hi-res wired and CD-like quality wireless listening. Even if the style isn’t for you, the functionality and versatility of these headphones deserves to be lauded. Recently announced, the V-Moda Crossfade 2 Wireless Codex Edition headphones are 1) a mouthful and 2) an improvement upon the Crossfade 2 Wireless. The Codex Edition headphones include the same design external design, battery life, and hi-res audio reproduction (wired-only) as its predecessor with one major improvement: the support of the aptX and AAC Bluetooth codecs. With this new addition to the V-Moda family, does it render the Crossfade 2 Wireless irrelevant or does the subsequent price reduction make them an absolute steal? Editor’s note: this review was updated on March 5, 2019, to include information regarding amps and DACs. Who are these for and what’s the Codex Upgrade Program? Being able to brand yourself on the shields is a great feature for DJs and plain ‘ol fun for the rest of us. Well, according to the V-Moda website, these are for virtually anyone; though the company isn’t wrong, let’s narrow that down a bit. DJs and anyone who’s rough with their stuff. So you need something that can keep up with your fast-paced lifestyle? Say no more. The patented SteelFlex headband can withstand at least ten instances of being crushed flat. Additionally, each headphone undergoes military-level MIL-STD-810G ensuring durability. And, you can get your logo engraved on the interchangeable shields. Audio enthusiasts. The 50mm dual-diaphragm drivers are engineered to promote clarity and prevent midrange and treble masking. If you’re like our executive editor Chris Thomas, Bluetooth is the auditory thorn in your side, but the Crossfade 2 Wireless Codex Edition includes aptX and AAC codec support, so you can enjoy CD-like quality without worrying about wires. If you’re still staunchly against Bluetooth streaming, these are hi-res certified by the Japan Audio Society when in wired mode. Those who enjoy the finer things. V-Moda is produces excellent quality, durable products. But it these aren’t just for people who are rough with their headphones. No, no, no, that would be too plebeian. When you customize your cans before checkout, one of the plate categories is precious metals. From there you’ll find 14K gold in a variety of colors, platinum, sterling silver, and more. If you’re reading this as a current Crossfade 2 Wireless or an original Crossfade Wireless owner experiencing buyer’s remorse, don’t worry. V-Moda announced its Codex Upgrade Program. This gives Crossfade Wireless and Crossfade 2 Wireless owners a $200 or $250 coupon code towards the Codex Edition. The company spared no attention to detail as even the zipper design is unique and durable. The V-Moda Crossfade 2 Wireless Codex include a gold plated ¼” adapter; an exoskeleton case with a carabiner clip; an Aramid fiber-reinforced 3.5mm cable with one-button in-line mic and remote; a micro-USB cable; and the headphones themselves. V-Moda stands by its product by providing listeners with a one-year warranty, and 50 percent immortal life program replacement support. Should you manage to destroy your headphones with normal use, send the pieces back and V-Moda will hook you up. How are V-Moda Crossfade 2 Wireless Codex built? V-Moda’s modus operandi consists of producing tough-as-nails products that have specs to match. The Crossfade 2 Wireless Codex is no different. Each unit is subjected to rigorous testing to meet military-grade MIL-STD-810G standards. This testing—in tandem with the lightweight metal construction and signature CliqFold hinges—makes these an excellent option for travelers, DJs, gym goers, and the like. The SteelFlex headband stays true to its name. Not only is it tested to withstand at least 10 flat bends, but it can be contorted any which way too. With all of this talk of metal components and a battery of testing, you may be concerned about comfort. Fortunately, the cushioned SteelFlex headband and large memory foam cushions provide ample support. Not only that, but the ear cushions have small cutouts in the vegan leather wrap for improved air circulation. Though your ears will still get hot while wearing these on a summer day, they won’t be completely suffocated. And if you’re not one for hearing strangers’ conversations on the subway, you’ll revel in the fact that the dense memory foam material isolates fairly well. Airflow vents on either side of the case prevent your cans from smelling like mildew. As far as the accessories are concerned, well, the V-Moda designers and engineers paid attention to the look and feel of the 3.5mm aux cable and hard shell, exoskeleton carrying case. The former is Aramid fiber-reinforced and features a 45° termination to prevent torsion-induced breakage. And the carrying case features airflow vents on each side, preventing your headphones from marinating indefinitely in your sweat. It also features a slew fastened elastic bands for storing the included cables. Usually circumaural headphone controls are placed on a lateral edge of one of the ear cups. In the case of the Crossfade 2 Wireless Codex, though, they sit just above the shield in an upside down V-formation. This definition makes it easier to identify which button is which. Sure, there’s no mistaking that the buttons are plastic, but they provide the perfect amount of resistance. The plastic toggles are the cheapest part about the headphones, but he placement and tactile response make that easy to forgive. If you’re going wired for that Japan Audio Society-approved hi-res audio, be aware that the in-line mic and one-button remote doesn’t allow you to control the volume. That said, you still have access to your respective virtual assistant and can perform basic playback and call controls, which is arguably more important than volume toggles. Durability and longevity aside, one of the major selling points of V-Moda headphones is that you can customize nearly anything. Like most headphones, you have control over the general color palette—black, black/rose gold, and white—but you can also choose the shield material and color; the screw material; and what accessories you want to include. Our SoundGuys-branded review unit is outfitted with the default aluminum shields, but you can choose gold, silver, and even platinum. Of course, opting for modest 14K gold-plated shields will cause the price to skyrocket from $350 to $1,000. Choosing platinum shields? Ouch. That’s going to run you $27,000. Luckily, the default aluminum options don’t alter the price, and they come in a variety of colors. Regardless of the material, you can get the shields either laser engraved or 3-D printed with a design of your choosing. If you’re a gamer, then you may be drawn in by the zero-latency wired mode. Some Bluetooth headphones maintain keep various electrical components running even when you use the cable, but the Crossfade 2 Wireless Codex immediately shut off all electronics, which allows for instantaneous audio response time. This is imperative for gamers, and V-Moda offers a compatible BoomPro microphone that’s similar to the one found on the Beyerdynamic Custom Game. 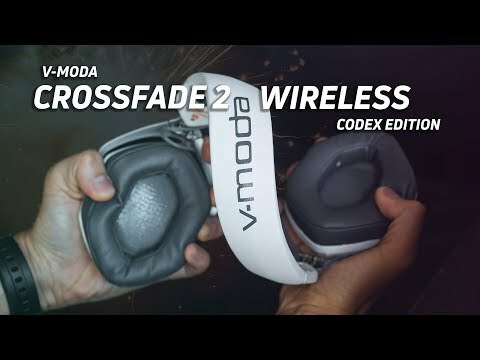 What’s the difference between the Crossfade 2 Wireless and Crossfade 2 Wireless Codex Edition? For avid supporters of the V-Moda brand, you may be wondering, what’s the difference between the former Crossfade 2 Wireless and current Crossfade 2 Wireless Codex Edition headphones? Is it worth buying the new version over the old? Well, as everyone loves a good ‘ol venn diagram, we’ve laid one out for you to better inform your decision. Spoiler alert: the only notable difference is the added codec support. The V-Moda Crossfade 2 Wireless Codex has plenty in common with its predecessor. The Crossfade 2 Wireless Codex are comfortable enough to be worn all day. A 430mAh battery supplies 14 hours of playback time before needing to be recharged. If you find that you forgot to charge the headphones, that’s OK, because these use quick charge technology and require just 30 minutes to provide four hours of playback. A full charging cycle will take a bit longer at around 2.5 hours. CliqFold hinges allow for the Crossfade 2 Wireless Codex to become compact. These predominantly Bluetooth headphones feature a 10-meter connectivity range. And as we’re seeing more and more in mid-to-top tier headphones, multipoint connectivity is supported here, so you can connect to two devices simultaneously. What’s more, aptX and AAC codec support means there’s virtually zero perceptible wireless latency. Again, you can always unravel the included 3.5mm aux cable for some hi-res audio quality. How do the V-Moda Crossfade 2 sound? Clarity is pristine thanks to a few things going on under the hood including the 50mm dual-diaphragm drivers, integrated Micro Vamp—an amp/DAC combo—and lest we forget, aptX and AAC support. Since improved codec support is at the heart of this headphone, I’ll be discussing the sound from the perspective of aptX Bluetooth streaming. The pads included with the V-Moda Crossfade Wireless 2 offer a starkly impressive level of isolation, and this is a big upgrade. It looks like V-Moda ditched the thinner stock pads they used to offer in favor of the deep, plush XL pads. This affords much better isolation, as they are capable of actually encircling an ear, instead of just sitting on them. Generally speaking, the low-end frequencies receive quite a bit of emphasis, but as V-Moda claims on its website, the dual-diaphragm drivers promote frequency separation. The bass doesn’t degrade midrange audibility too much, but there’s no question that it’s not a neutral frequency response, which is completely OK.
Rainbows as performed by James Lindsey and Cicily is a comforting hip-hop track that sounds great through these bass-favoring cans. Straddling the line of sub-bass and bass, the drop at 0:20 is felt as much as it’s heard at around 60Hz. Lesser quality drivers may be perplexed by this kind of bass response, creating a lack of clarity any time the bass bumps. However, the Crossfade 2 Wireless Codex handle this with ease. Repeated with each refrain, the biggest bass drop does mask Lindsey’s vocals ever so slightly. The best example of this can be heard at 1:10, where Lindsey sings, “Rainbows.” Now, these headphones parallel the 1More Triple Driver On-Ear, whereas other cans, like the Sennheiser HD 598 CS, can’t separate the low-end frequencies from vocals with the same proficiency. During the bridge at 0:37, Lindsey shares his personal exploits pertaining growing up in the unsavory areas of Louisville, Kentucky. As Lindsey reflects on certain tribulations, he takes a few inhales. This may seem like an odd thing to highlight. But I’ve heard this song well over 200 times and have never noticed his breathing. Prior to the Crossfade 2 Wireless Codex, his breaths had been masked by Cecily and others’ voices along with the staccato synthesized noises. Hippo Campus’ song Warm Glow elicits feelings of warmth, as one would expect given the name. Transitioning from etherealism to what could be interpreted as a more grounded internal monologue at 2:57, this part of Warm Glow is dependent upon the steady hit of the cymbals while Jake Lupen and Nathan Stocker’s vocals become interwoven. Their voices are easy to hear above the instrumental picking and constant hi-hat hits. It isn’t until 3:50 when the drums and vocal echos re-enter that the hi-hats become difficult to hear. V-Moda’s latest endeavor, the Crossfade 2 Wireless Codex Edition, is an excellent headphone with a hefty price tag. If you’re coming here as someone who puts durability and longevity first and foremost, then yes. 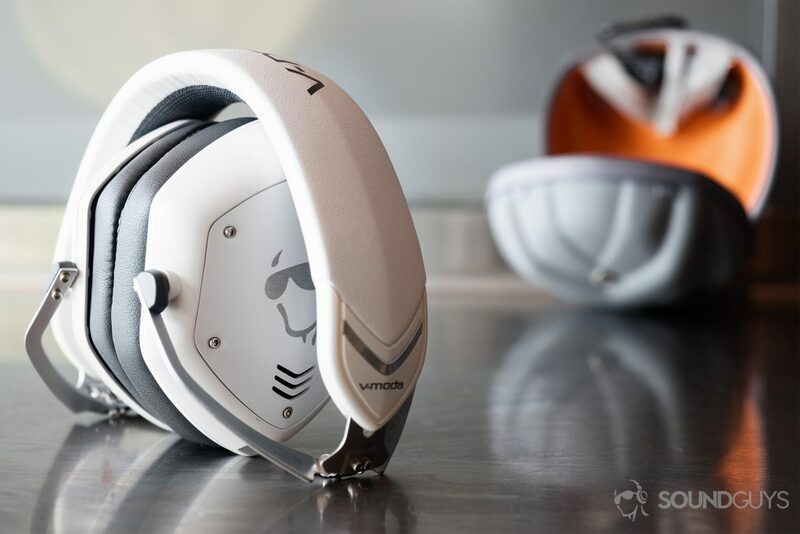 As the company’s products are known for, these headphones can withstand nearly anything, and if on the off chance that they are crushed under the pressure, you can always contact V-Moda about its Immortal Life Program. Toughness aside, these are some fantastic headphones that are compact enough for travel but comfortable enough for all-day wear. However, if you already own the Crossfade 2 Wireless and aren’t enticed by the aptX and AAC compatibility, even with the Codex Upgrade Program, then you’re better off saving your money until you need to swap your headphones in for a worthy V-Moda upgrade, or until you’ve moved onto a different style of headphone. That said, even though these are expensive for headphones that don’t support aptX HD, they provide plenty of noteworthy features—like hi-res wired listening and military-grade durability—that make them worth it. Crossfade 2 wireless gives you the best of both worlds: virtually identical sound in Bluetooth mode and pure analog wired mode for audiophiles, gamers, musicians and DJs... or if you just run out of juice. Unlike other Bluetooth headphones, inserting a cable plug into the headphone jack switches off all electronics to achieve zero latency, “essential" for gaming and musician use. Powered by brand New dual-diaphragm 50mm drivers and hi-resolution CCAW coils made in Japan, Crossfade 2 is certified by Japan audio society (JAS) to Hi-Res audio standard when cabled. For near-CD quality wireless playback, Qualcomm aptX audio codec is included. Brand New, large memory foam ear cushions provide supple ergonomic comfort for extended listening sessions. The cushions and steel flex headband adapt to your head and ears to create perfect natural noise isolation, Optimal bass and an immersive 3D soundstage. The fans-favorite CliqFold Hinge has been added for ultimate convenience and to fold the headphones into the impossibly small exoskeleton case on-the-go. Easily pair your Crossfade 2 wireless to a Bluetooth device and enjoy your headphones up to 33 feet (10 meters) or more. They can also be paired with two sources at the same time via multi point such as smartphone and laptop or smartphone and smart watch. The built-in hidden microphone is specially tuned for phone calls and voice recognition and a rugged Kevlar-reinforced 1-button Speakeasy cable for wired use is included in the box. Crossfade 2 wireless keeps faith with V-MODA heritage thanks to the luxurious combination of steel and New vegan leather, meeting military-level standards of the MIL-STD-810G testing guidelines. The rechargeable lithium-ion battery provides up to 14+ hours of continuous music, entertainment and calls. Recharging is easy via the elegant V-Micro USB cable. Discover V-MODA world via Crossfade 2 wireless and enjoy Our unrivaled Six-Star customer support, Our 50% Immortal life Replacement program and 1-year premier warranty.